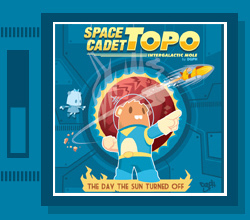 Can the brave astronaut Topo relight the sun's flame before everything freezes forever? "What an engaging story, with crisp artwork, charming characters, and a noble hero! After reading this fanciful adventure, I hope young Space Cadets will be inspired to learn more about stars, outer space, and the amazing universe around them!" Space Cadet Topo presents new goodies avaiable t the download section. Have fun with the wallpapers and the coloring Topo pages! Space Cadet Topo comunication system is online! Prepare for the book launching in T minus 4 months!